Should "Super Dog" go to Kindergarten? So I had an absolutely ridiculous instant messaging exchange the other day. Something like this: Friend: “So you’ve had the dog for what a month or so now?” Me: “Yea a little over a month.” Friend: “Seems like Caden still has autism.” Me: “Um yea, he does. I’d better check on the kids and see if they’re back from the moon yet or not.” Okay, so maybe not the moon part, but did someone really try to equate a service dog with a cure for autism? Wow, that’s all I can really say about that one other than Wow, Wow, and yet another Wow. In a bit more intellectual news I’m learning that there’s a lot more to having a service dog than the name would imply—interestingly that’s how I feel about autism each and every day as well. Anyway the law in a nutshell states that a service dog can go into any public place that a person can as long as the dog is under control and well maintained (i.e. no fleas, proper grooming, really just the basics in good dog care). Now it starts to get complicated in public schools though. When you think about the areas really open to the public during school hours you quickly realize that visitors can come in the front door and then immediately sign in at the office. From that point, where they are allowed to go depends on why they are there. In a sense then classrooms aren’t necessarily public areas and in many instances you need to rely on the good will of the school system to allow your service dog to stay with the child. Caden attends a public charter school—enrollment is less than 100 for ages 3 through 9th grade but Children’s House (preschool and kindergarten) has a fairly high enrollment this year. Long story short is that the teacher has her hands full and I don’t want to do anything to add to that. When I start to think about Elf going to school with Caden I have a few hesitations. One, like I already established, the teacher has her hands full and I don’t want a dog serving as a classroom distraction and the kids most definitely get excited when they see Elf. Maybe they would eventually get use to his presence but I can only imagine it would be a crazy few days until they settled into the routine. Two, I’m not sure Elf and Caden have reached that point in their relationship where Elf would be beneficial to Caden in an educational setting. We are still working on behavior disruption; starting Thursday though Elf will attend Caden’s speech therapy sessions at the hospital so that may give us a better sense of how they’d do in an educational setting. Three, I don’t know how we’d work an aide into the Montessori classroom without disrupting some of the basic principles of the school and learning environment. We picked this particular school, even though it is a mainstream school, for many reasons including their educational philosophies so we don’t want to do anything to undermine those. Finally, I just learned today that dogs are actually considered taboo or unclean to particular ethnicities and/or religions. It just so happens, that there is a child in Caden’s classroom who is of this particular heritage. I don’t know if this taboo or belief applies to the child or their family but I also can’t really think of a polite and nondiscriminatory way of asking “so are you by any chance xyz; have any religious or philosophical problems with dogs?” Can’t ask the question but also don’t want to inadvertently create an environment where this child and their family no longer feel comfortable or accepted. Never in a million years did I expect that type of philosophical issue to be a challenge when we set out to get Caden a service dog. I honestly don’t know what our next step is. We’ll probably see how they do in therapy on Thursday and watch them over the next few weeks while we also work on updating Caden’s IEP at school and assessing where and what his needs are. Thankfully at the moment, Elf is able to go to college with us every day so he continues to be exposed to people and practicing obedience daily. We’re also finding fairly easy ways to incorporate tracking training with Elf and Caden into our weekly lives. Now I have to say just because we think he’s amazing we are no longer referring to Elf as a service dog, instead he’s super dog and given all the tail wagging he did today, I’m pretty sure he knows it too. And just in case you’re wondering if we happen to stumbling across the overnight “cure” for autism, I’ll be sure to blog it asap…….. Believe it or not, the one month follow up paperwork came in the mail today. Yep, we’ve been home from 4 Paws For Ability with Elf a little over a month now. It has been an interesting and eye opening month. Although Caden was adamantly opposed to the idea of a service dog, he really seems to love Elf (as long as we don’t use the “service dog” phrase). If we need to correct Elf for any reason, Caden readily jumps to his defense as to why he shouldn’t be in trouble. If we need to leave Elf at home, Caden is the first to question why Elf isn’t going with us. And although Elf adores everyone in the family, he seems to know that Caden is his first priority. The first few days we were home, it felt like he was more our dog than Caden’s and I have to admit I was a little worried. Over time though he has come to recognize that while he takes his orders from us, his devotion truly is to his boy. 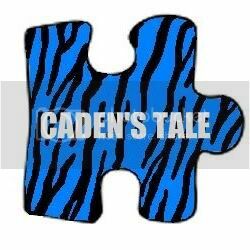 He quickly comes running when he hears something that signals Caden is sad, scared, melting down, or even hurt. He doesn’t always know yet what the appropriate reaction is but he is starting to realize that nuzzle, kisses, or lap always seem to be a good choice when in doubt. Interestingly he is also seems to be able to recognize when Caden is getting sick; I suppose something doesn’t quite smell right. Although unexpected, it is a great addition in our arsenal of fighting the immune deficiency battle. Having established his loyalty to Caden, I must say that when he and the family come to visit Ryley in the hospital during her infusions, he is genuinely worried and doesn’t like Ryley in the hospital bed or all of the medical smells around her. It’s great that we don’t have to limit Ry and Elf’s time together to ensure that he and Caden bond—that was most definitely a worry that we had and a reality that we know other families have to live. I’ve developed an amazing respect for dogs. I even think it’s possible that I might have been more of a dog person to start with, if I had grown up around dogs who listen AND actually follow commands (in case you are wondering, I am still pretty fascinated with Elf’s “potty” command). Okay, in defense of Maizy and Nikki, they have actually learned some manners and even our neighbor who NEVER talks to us, admitted that they are better behaved these days—I think that means they only bark 90% of the time they are outside, instead of 99% but it is progress. In the interest of full disclosure I should probably tell you though that the universe has been quick to reprimand such thinking on my part---we now have three stray kittens (guess they aren’t so stray now, are they?) to add to the five cats we already have. Maybe one of our biggest accomplishments upon arriving home is again working on Caden sleeping in his own bed. We frequently talk about how he isn’t alone in his bedroom because his buddy Elf is with him. He’s a smart kid though and recently I came upstairs from the laundry room to find Elf and Caden playing outside in the backyard (thank goodness it is fenced). I reminded Caden that he mustn’t go outside by himself and you got it---his response was but mommy I’m not outside by myself, Elf came with me. And once again the 5 year wins the battle of logic over mommy. When it comes down to it, I think he’s right….he really isn’t ever alone between his dad, sister, me, and Elf. It really is becoming a tale of an amazing dog and his boy. One thing that my family has always enjoyed doing is going for drives. When the weather is pretty and we have some free time, we pick a direction and drive. Windows down, no radio, and usually lots of off the wall conversation. Some drives take us to neat little towns where we find hole-in-the-wall restaurants or quirky hardware stores that we’d otherwise never known were there. Other drives lead us nowhere; nothing all that amazing discovered but most definitely not wasted time either. And then there are the unexpected drives, otherwise known as getting lost. You know the drill: you drive until you realize that you aren’t where you anticipated and then you turn around and hope desperately to find your way back all the while watching the clock because inevitably you have someplace to be. The kids started back to school last week. As always I was a worried mama on the first day worried about new friends, old friends, new routines, old routines, and so on. The first day was an awesome drive; Caden’s teacher texted us a picture of Caden helping a new child learn one of the classroom activities. How awesome and unexpected was that journey? Ryley came home declaring that this is the year that she is going to love school and kept talking about how the four 6th graders got to sit together because well, they are the 6th graders after all. That’s a pretty amazing drive as well. Then days two and three brought the realization that now that Caden is in kindergarten, we need to revisit the IEP and establish more educational goals. Some of that trip is familiar territory; we know we’ll need speech and occupational therapy. He loves numbers and logical activities but letters and reading continue to escape us. He can write his name but only because he knows those 5 shapes make his name, not that they are the letters of his name. It felt like a fork in the road; our sunny drive had left us most undoubtedly lost. The realization that he could only recognize 2 cursive letters during assessment testing confirmed our belief that our road trip had taken us to an otherwise deserted town where we weren’t going to find anyone who could give us directions home and most definitely our gps couldn’t help us out. The thing about not knowing where you are is that you never know what’s around the next corner. We were lost, didn’t know where to go, and it only made sense to keep driving because what else could we really do. Caden’s teacher decided to test him on printed letters and all of a sudden we were in an amazing town with a year round carnival and all the cotton candy you could eat; Caden identified 11 letters correctly. This was crucial information to write into the IEP and all of a sudden the GPS picked up a signal and we were on our way home with the windows rolled down and the sun shining. It’s interesting how when you leave home in the morning, you never quite know where the day will take you.